The most common cause of tooth loss today is gum disease and this results from incorrect oral hygiene allowing plaque to accumulate on the gums. As the plaque builds next to the gums, the body’s defenses overreact and the gums bleed and become swollen. At this stage there may still be no pain or discomfort. The early sign of the gums bleeding when brushed is often ignored. If all this is ignored then, in time, the gums lose their attachment to the teeth. The bone around the tooth recedes and the tooth becomes progressively looser until it is lost. During this later stage there are often episodes of pain and infection, abscesses and halitosis (‘bad breath). A hygienist, working under the prescription of the dentist, undertakes much of the treatment of gum disease. The hygienist specialises in the treatment of gum disease. To prevent the onset or progress of gum disease we need to remove all the hardened plaque (sometimes called tartar, or calculus) from the tooth surface. This will reduce the inflammation in the gums and allows tooth brushing to be more effective. To prevent the recurrence of gum disease we need to aim towards is perfect oral hygiene, which means total removal of all the plaque from all sides of the teeth at least twice a day. This normally involves tooth brushing and flossing. A good quality medium or soft bristle toothbrush with a short head is usually recommended. Once the bristles become bent, replace it. DO NOT use a hard bristled brush; this will damage your teeth and gums more quickly. Techniques do vary but the bristles of the brush need to be pressed up between the tooth and the gum, usually at about 45 degrees and then, under moderate pressure, the brush can be moved back and forth for about 10 strokes per tooth. This is then repeated in a vertical up and down movement. The importance is for all sides of the teeth to be cleaned, especially the areas between the teeth. 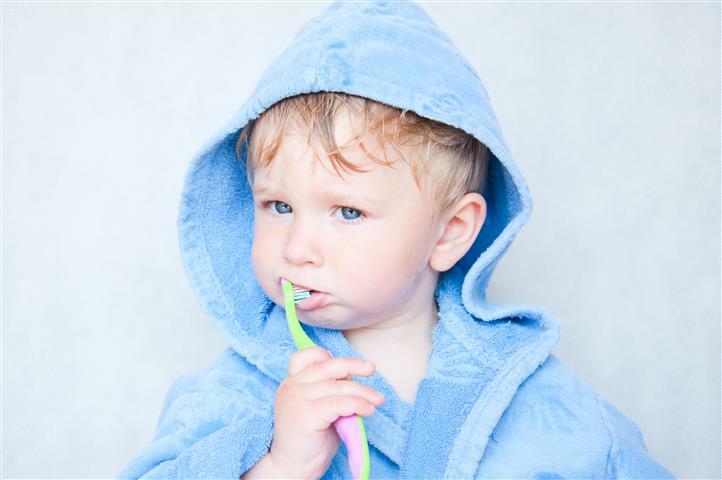 It is not possible to clean between your teeth with a toothbrush alone. It is these regions where most of the recession and decay starts so it is vital that this area is also cleaned. Take a piece of floss about 50cm long and, starting from one end, wrap it around your middle fingers. Then, using your first fingers and thumbs, and keeping them about 1cm apart, you can manipulate the floss between all your teeth. The floss should be slipped up between the teeth, the floss being kept tight and bent around the tooth that is being cleaned. It should be moved in an up-and-down action (not a sawing action), taking the floss up under the gum as far as it comfortably will go. You floss each surface until no more plaque remains, wrapping the floss off one finger and onto the other. Flossing all your teeth every two days is usually recommended, but this varies from person to person. Remember that you are cleaning your teeth, not the space. If the floss catches or frays this may be from rough or chipped fillings which may need to be smoothed or replaced. Let your dentist know about these problems when you are in the practice so that these areas can be inspected. Remember that you are cleaning the tooth, not the space. 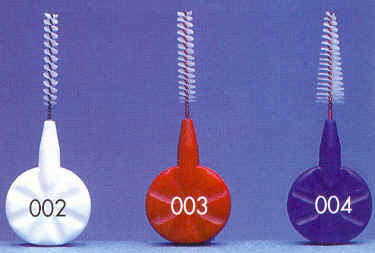 Interproximal brushes are small brushes that work on the same principle as a ‘bottle brush’. They come in a variety of sizes and your dentist or hygienist can advise you which size will be best for your teeth. When used they should slip into the spaces between your teeth and remove all the plaque. Most patients find them easier to use and to master than dental floss. Several excellent products are available now to assist cleaning the teeth using ‘water jet’ technology. These machines use gentle pulses of fluid to wash plaque and debris away from the teeth. They can use water or even certain antiseptic mouthwash products. These are meant to be an adjunct to good tooth bushing and flossing, not an alternative. Discuss them with your dentist to find out more. Any bleeding that appears whilst you are brushing or flossing is normally a sign that some gum disease is present. This is caused by not enough accurate cleaning over the preceding days. Contrary to popular belief you need to brush and floss these areas more. not less, and if the bleeding does not resolve within a few days, contact the practice.